- Easy cutting: Specially designed blades shapes. - Long lasting: Specially stainless steel and heat treatments in iron steel. - Light weight: PVC handle is available. 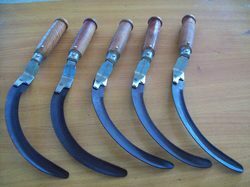 Pioneer in the industry, we are engaged in trading an impeccable range of Garden Sickle. We are the leading manufacturer and supplier of Knives & Sickles in, Madurai, Kozhikode, Kannur, Cochin, Allepy, Alappuzha, Wayanad, Thrissur, Pathanamthitta, Kasaragod, Kollam, Thiruvananthapuram, Ernakulam, Idukki, Malabar, Thrissur, Palakkad, Kottaiyam, Coimbatore, Chennai, Bangalore, Mysore Tamilnadu and Kerala, all over India. A traditional tool to cut through rough grass and weeds.